“I packed a pile of my old black notebooks. 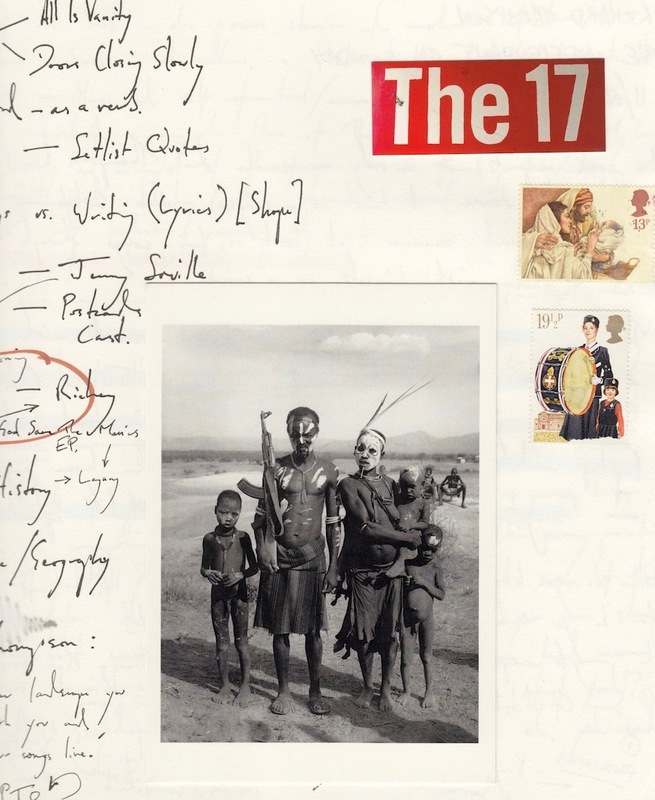 They were the notebooks for the ‘nomad’ book, which I had kept when I burned the manuscript,” wrote British travel writer Bruce Chatwin in The Songlines in 1987. 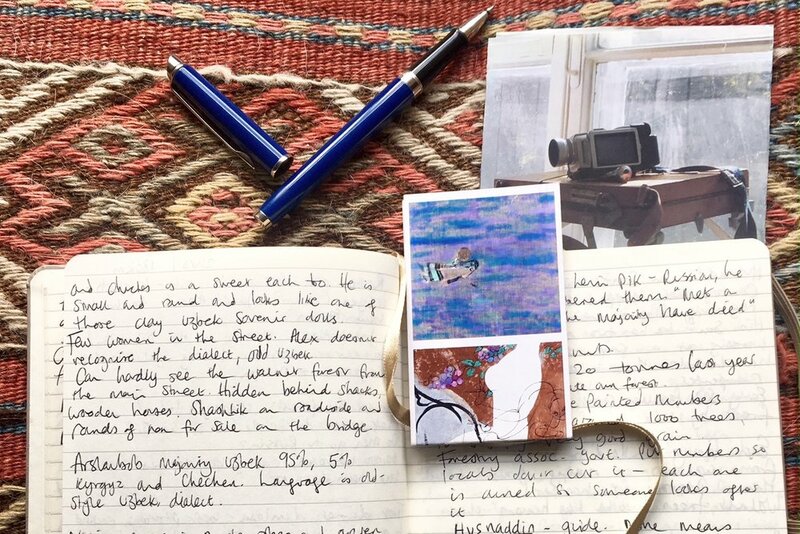 “They contained a mishmash of nearly indecipherable jottings, ‘thoughts’, quotations, brief encounters, travel notes, notes for stories…” He called them his ‘Paris’ notebooks. Each time Bruce Chatwin went to Paris, he would buy a fresh supply from a papeterie in the Rue de l’Ancienne Comédie. The pages were squared and the end-papers held in place with an elastic band. A notebook is a diary. And a diary is like an unmade bed, its pages full of wrinkles left on the sheets by a dreaming body, not smoothed out yet, something you rarely let anyone see. 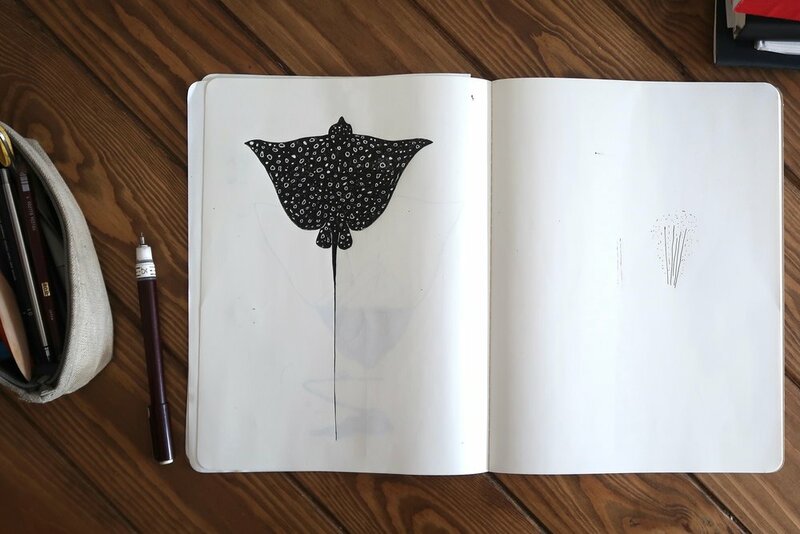 Still, I asked five writers and artists – Caroline Eden, Horatio Clare, Dan Richards, Joe Lyward, and Philip Hoare – to open their notebooks and reveal their note-keeping habits (or fetishes), including the pens and pencils, they use. British writer Caroline Eden’s new book Black Sea: Dispatches and Recipes Through Darkness and Light, just published, follows the success of her debut book, Samarkand: Recipes and Stories from Central Asia and The Caucasus, co-written with Eleanor Ford, in 2016. For a decade or so, I was loyal only to BIC Orange Originals: cheap, plastic and ingenious in design. Their barrels hexagonal-shaped, their caps bullet-like and, on the page, the nib giving a pleasing mild scratchiness. Between fingers, they worked as a replacement cigarette, the caps, something to chew on. I’d get through dozens over a year, unworried if I lost them. Recently, when I published Samarkand, I was given a surprise gift at the other end of the pen spectrum: a Waterman Hemisphere Rollerball. Its weight means it skates, flows and slides across the page. My pen is blue but I only use black ink. It is a loyal friend in my pocket wherever I go but I am now hopelessly attached to it and live in constant fear of losing it. A replacement, even an identical one, wouldn’t be the same. As for my notebooks (one of which is pictured above), I am far messier and far less choosy. Castelli notebooks, Italian made, work for me for many reasons: they’re not wildly expensive, they have a little ribbon bookmark, a pocket at the back (for business cards and receipts) and an elasticated hoop for a pen. Hardback is my only real requirement in a notebook as it makes writing standing up easy. Welsh-British writer Horatio Clare has written many travel books and essays, including his latest Something of his Art: Walking to Lübeck with J. S. Bach, published this autumn, and Icebreaker: A Voyage Far North, that came out last year. His next non-fiction work will be set partly in present-day southern Europe and partly over two thousand years ago, when Sicily and southern Italy were Greek. I started in journalism and writing with reporter’s notebooks. I have shed-loads of them, spiral bound, proper notebooks I got free from the Mid-Devon Gazettte, Western Mail, Newcastle Journal etc. Pen and pencils tended to be whatever I could get, whatever was there. I also had a tendency, a chaotic routine, of starting notebooks at the back and front simultaneously and leaving pages blank for reasons I was clear about at the time, but… well, you can imagine. Another problem was that fat reporter’s notebooks are great but if you lose one, you lose weeks. Later, it was Moleskines. The first pages of my book, Running, are in one. They’re very good kit, the Moleskine — basically bullet-proof (up to 9mm) and stab-proof. With a good biro one could go out drinking in Brazzaville or even Kinshasa and if quick on the draw, be fairly sure of coming home. You can easily kill someone with a decent pen of course, or disable them with a straight-arm, Moleskine-in-palm blow to the face. You look like you know what you’re doing with a Moleskine, which can be good. However, I don’t really use them now. Dad started giving me gorgeous, leather-bound lovely Italian paper notebooks: a small pocket one first, which I love, and then big gorgeous ones like bibles. Gavin Bell, impish Glaswegian ex-Reuters bureau chief in Beirut, now travel writer and legend, said “My, what a big notebook you have!” when we were on a job together on a boat off Scotland. The whole of Down To The Sea In Ships is in one, taken down in real time, basically. My two best, content-wise, went off the cliff at Europa point in Gibraltar towards the end of the journey for A Single Swallow. I will always massively regret doing that but it was the right thing at the time. Real writers, pros, tend to use something very small, light, and tough. The famous and famously beautiful Bushra Sultana gave me one, which was also fat and gorgeously bound (leather), perfect Italian paper again, and when that hippo bit our canoe in half, it floated down the Kafue river. The photographer/travel maestro Alex Edwards was able to pluck it up on his way to rescue us in the other canoe. The water had barely touched the paper. Alex sweetly gave me a stack of about twenty Natural High pocket notebooks, cardboard cover (moon-phase chart from last year printed inside), good paper, the size of a small wallet, maybe fifty pages — perfect. Slips inside your jacket or jeans, light and stab-proof. I write, sketch, doodle and scrawl in them. A loss wouldn’t be a disaster because they do fill up. My writing is fiercely illegible, which is good. Police/gangsters/border guards can’t read it. You can claim it says anything or nothing. So I now carry one of them in my pocket and another — something bigger, beautiful — in hand or rucksack. In India you can get lovely school exercise books, gorgeous printed covers, which are perfect — light, flexible, loads of pages. Having a beautiful notebook can be very advantageous. In Belize recently, drinking and dining with Kim Simplis Barrow (her husband happens to be the Prime Minister of Belize) my very pretty notebooks had her and some top-line, sublime PRs (young women based in Miami), swooning and admiring its covers. In Italy for The Financial Times, a few weeks ago, the notebook pictured for The Island Review looked absolutely fitting and in place in the three stunning palazzi where we stayed, including Francis Ford Coppola’s house. We dressed for dinner nightly; the notebook looked like it already was. I am writing this in the house of Deborah Jones and Niall Griffiths. He uses what we used to call ‘red books’ at the BBC — big A4 office notebooks — which the BBC handed out, everyone used them, job done. So sensible: typical BBC. And Niall uses loose paper. 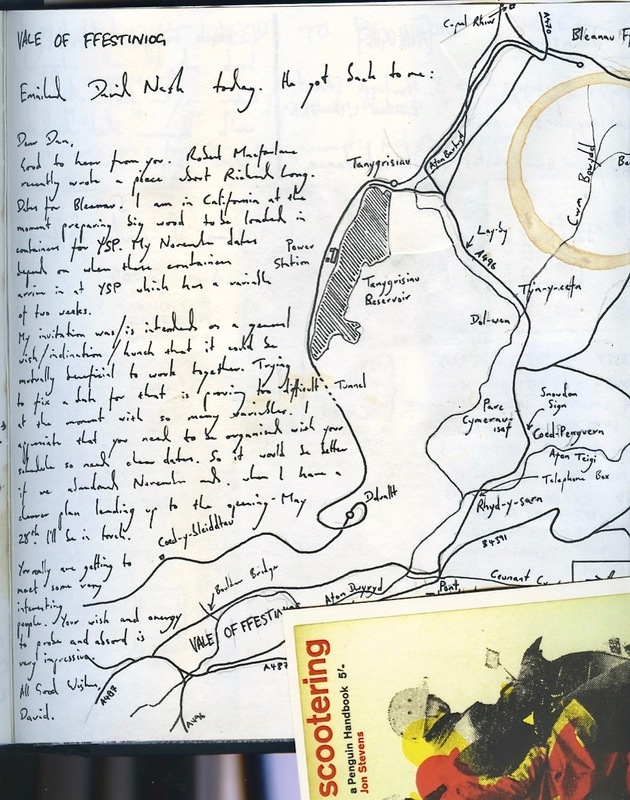 He is archived by the National Library of Wales which buys his notebooks from him. One day I hope I will join him there, and I like the idea that I will be able to at least attempt to inflate any price offers by pointing out that while the content of, for example, Niall’s notebooks is astronomically valuable (now and ever more so, in the future) mine, technically, were more expensive to buy! British writer Dan Richards is a co-author of Holloway, with Robert Macfarlane and Stanley Donwood, published in 2013; He also wrote The Beechwood Airship Interviews, published in 2015, followed by Climbing Days, in 2016. His next book, Outpost, a journey to cabins, eyries and beacons on the edge, will be published in April 2019. I tend to use whatever comes to hand when out and about but, when sitting down to write, “staying in to get things done” to paraphrase Bowie, I use Palomino Blackwing pencils and black 1.0m Uni-ball Gel Impact pens for their smooth, thick line. The pencils were recommended to me by my friend Ed, at Mr. Bs bookshop in Bath, a fellow stationery enthusiast. Deployed by Disney, NASA and Steinbeck, the lead is luscious, good for drawing and writing, and the flattened rubbers on the top actually erase. Notebook-wise, the German brand Bindewerk are excellent, really well designed — good unlined paper, hard covers with rounded corners and a sturdy elastic band to hold the thing together whilst travelling. Looking back at scrap and notebooks — because I often stick images and extraneous jottings in, together with coffee stains, tickets, and the like — I can instantly tell when I was writing on the go; scrawling or sketching whilst walking around, or transcribing somebody else’s words because, to save time, the left-hand pages of a book are blank whilst the right are filled with indecipherable runes and scribbles: written, over-written, highly impressionistic, illegible memory ledgers. Currently based in Tokyo, Japan, Joe Lyward is British illustrator, picture-book maker and designer from the southwest of England. I tend to have lots of concurrent sketchbooks for different purposes, projects or techniques. Many of my sketchbooks I use only for drawing. I turn through the pages moving one drawing on from the last. My dad gave me a Rotring Rapidograph pen for my 15th birthday (his dad used to sell them) and I have used it ever since, although I have since bought a thinner nib. The ink is good and solid. It has a fine, clean line that is capable of recording my hesitance and wavers and flow. When drawing, I work directly in pen, I started doing that a while ago so that I would become better at drawing by learning to appreciate and work with the unexpected things the pen, or my hand does. I use it with Moleskine sketchbooks, not because they have good paper, but because the paper is actually a bit see-through. This means when I’m using the sketchbook it reminds me to consider the images in sequence, that a book is an object, paper is a material. Also if I want to change something I can use it to trace, add and redraw. 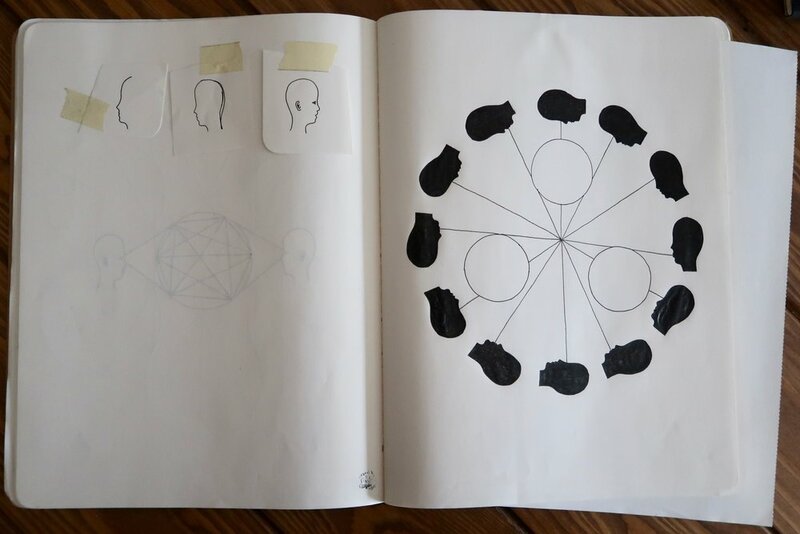 I like the feeling, when looking through a sketchbook, of seeing a drawing metamorphosing, building up, breaking down, or starting new conversations as I begin work on something new. British writer Philip Hoare is author of three books about the sea: Leviathan or, The Whale won the 2009 BBC Samuel Johnson Prize for non-fiction; The Sea Inside was published in 2013 and his most recent book, RISINGTIDEFALLINGSTAR, came out last year. He has also written books about Stephen Tennant, Noël Coward, and Oscar Wilde. My notebook is my home. It’s wherever I am in the world, the thing I retreat to. I’ve kept a notebook/journal/diary of one kind or another since 1974. I use black ink — it used to be a cartridge or fountain pen, now it's often a Uniball micro, but I'm going back to my fountain pen in the interests of using less plastic. I draw with a pencil, usually one stolen from an hotel. Young people often interact with my notebooks — they get the idea, immediately. Six-year-old Lilian drew the whale pictured above when I was visiting her in Amsterdam, and her four-year-old brother Freddie customised the sketch of my sutured hand with a skull and crossbones. Perfectly aptly, of course. Children, as well as being the best critics, are good at reminding us of our mortality. Like the sea. Like the rows of ring-bound Clairefontaine books I use, bought in London or Barcelona or Paris, my life marching across the shelves. The paper is good. It holds ink, memories, postcards, Pat’s cormorants, infinity, ambergris, sloughed whaleskin, murre feathers, and a pressed blue flower from the canal side in Northern France where Wilfred Owen fell. I feel as if I’d taken off all my clothes by showing these books. Luckily, my left-handed writing is virtually illegible to anyone but myself, and often not to me, either. Not that I need to read them. Sometimes I just have to smell them. As Michelle de Kretser, the wonderful Sri Lankan-Austrialian writer says, memory is the best editor. Anna Iltnere, based in Jūrmala, Latvia, is a regular contributor to The Island Review. She has opened a Sea Library by the Baltic Sea, focused on books about the sea. Coming from a family of artists, architects and actors, and formally a journalist covering the Baltic, Russian and Scandinavian contemporary art scenes, she now follows her passion, the sea.